NOTHING CHANGES is a portrait of Hank Virgona who is director Matthew Kaplowitz‘s uncle. 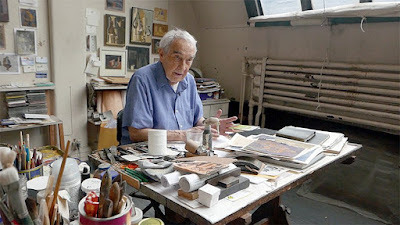 Virgona is an artist who has been making art in his Union Square studio since the 1950’s. He commutes from his home in Queens six days a week. While his health has deteriorated and his gait has slowed he still makes the trek into Manhattan hoping every day to discover little mistakes that reveal a greater truth. In its way NOTHING CHANGES is one of the best portraits of an artist ever put on film. A soup to nuts look at the man and his life you will come out of the film knowing Virgona and his work better than most members of your family. Certainly you will know the man’s work intimately. More importantly you will come to understand why and how he creates his art. His is not a quest to make money but to discover some grater truth about life. This film will go a long way to explaining why anyone does what they do. The reason the film works as well as it does is that the long interview with Virgona that makes up the spine of the film is filled out by wonderful talks with friends and colleagues who have known him for decades. They fill in details he leaves out at the same time giving his story some context. Through their eyes and words we come to understand just how good Vironga really is. If there is potential problem with the film it would be that the film can be very intense is showing Virgona create. If you don’t fully click with watching him drawn and paint explain what he is doing the film could seem a little draggy. While the sequences made me a little weary at times and in the moment, by the time the film had ended I had forgotten about them. Frankly if I hadn’t made a couple of references to them in my notes I never would have mentioned them. Over all this is a super film and highly recommended to anyone who loves art and the act of creation. Nothing Changes plays Sunday March 18th at the Queens World Film Festival. Thank You Steve for your great review of Our uncle Hanks film by our Nephew, Matthew, I cannot wait to see the film myself, I hope he can get it out here for a showing, I live in Northern CA. Matthew it a very talented filmmaker, I have seen one of his other works on Amazon Prime "Girl Fight: A Muay Thai Story". Our father who was Matthew's grandfather (Matthew is my oldest sisters, son) was a photographer for the US Army during WWII, so I guess the Photo bug runs in his DNA. I have been a advide amatur photographer myself since I was 14 yrs old (i'll be 65 this year) I used to help my dad in the darkroom when I got older.